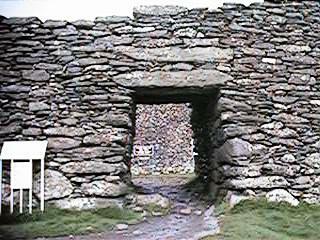 Cathair Na Stéige (Staigue Fort) is located in Castlecove on the road to Sneem in County Kerry. It is about fours miles off the main road. It is in excellent condition. It is thought that this structure was built in the first century B.C. and so it is over two thousand years old. Little is know about its builders or indeed what is was used for. It may have been built for religious reasons or to protect cattle. According to Pádraig Ó Loingsigh ("Staigue Fort", Oidhreact na Stéige, 1989), it may also have been an amphitheatre intended for some spectacle, a place to secure stock at night, a place of reigious worship, an observatory, a symbol of wealth and status, or a place of defence and security. 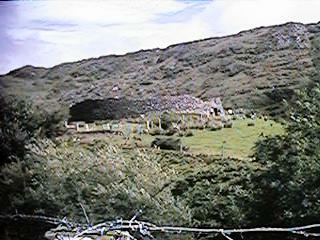 On the left is a photo of Staigue Fort as one approcahes it from the road. On the left is the entrance door to the Fort. On the left is a photo of one of the cells within the fort. These doorways are to be founds in the south west and north west quadrants of the fort. Opinion varies as to what these were. Some suggest that one of them was a kennel for the guard dog while others say that they were used to store food or imprison wrongdoers. 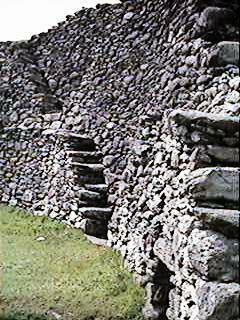 On the right is a photo of the stairs on the wall, which may have been used for access to the top.